With its DNA firmly embedded in a distant chemistry laboratory, Skwooshi is an innovative children’s moulding compound that is unlike any other. 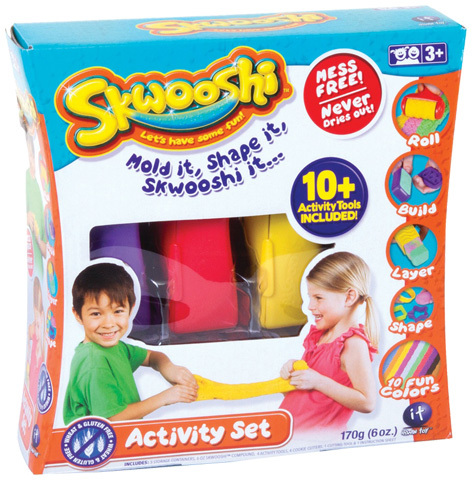 Whilst Play-Doh and Plasticine have reigned supreme for many years, Skwooshi will never dry out and is a truly futuristic product. Scientists describe it as a “Non Newtonian Fluid” with which kids can create the most amazing shapes and designs. Available in a series of different packs at several affordable price points, the rolling, building, shaping and layering characteristics of Skwooshi are almost unlimited. The selection of ten different colours can be mixed to almost any shade or hue. This advanced children’s craft product is supplied by Flair in the UK. The big activity set even includes a selection of ten plastic tools that help with shaping, moulding and cutting. A wheat and gluten free compound, not many users would disagree with Skwooshi’s strap line of “Let’s Have Some Fun”.